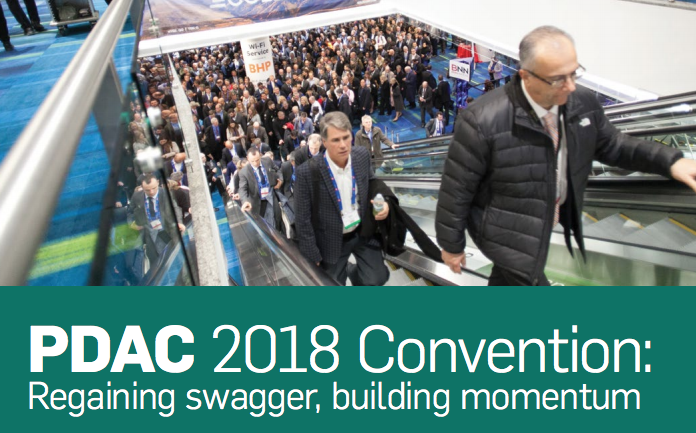 PDAC 2018 Convention—the world’s premier mineral exploration and mining event—attracted investors, analysts, mining executives, prospectors, geologists, government officials and students from a record 135 countries. PDAC hosted nearly 30 Canadian federal, provincial and territorial government officials over the four-day convention—a reflection of the association’s significant leadership role in Canada. An outstanding Technical Program featured Tito Martins (Nexa Resources S.A.) who led the Commodities and market outlook session; Daniel Malchuk (Minerals Americas, BHP), Sean Roosen (Osisko Gold Royalties) and Anna Tudela (Goldcorp Inc.) spoke during the Keynote session: Industry Review—Lessons for the future. (Roscoe Postle Associates Inc.), and Precambrian gold deposits (Mineral Exploration Research Centre, Laurentian University). Other course themes included minimizing environmental impacts, mining financial modelling, geochemistry, geophysics, health and safety, avoiding the legal pitfalls of working in South America, peer review and technical audits, NI 43-101, and the application of artificial intelligence and machine learning (Decennial Mineral Exploration Conferences). Attendees enjoyed continuous networking opportunities—700 people celebrated at the sold out Awards Gala & After Party where leaders in seven categories were honoured in recognition of their outstanding contributions to the minerals and mining industry, and the Grand Finale brought attendees together to celebrate the success of PDAC 2018.